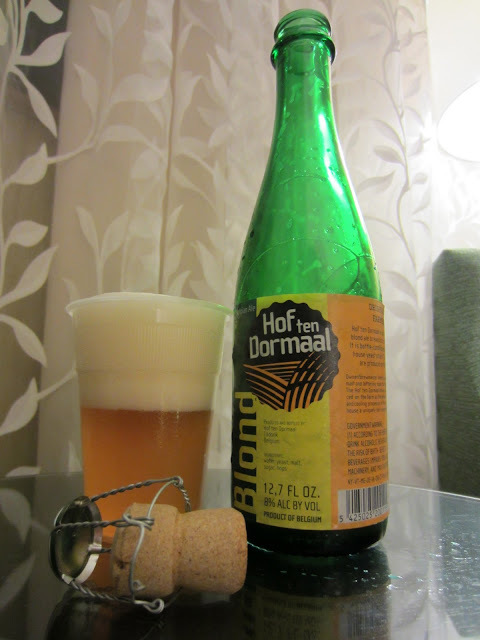 This blonde saison ale from Belgium-based Hof ten Dormaal pours a hazy unfiltered yellowy amber body with a straw-colored inner glow. The large head is a thick yellowed foam with sticky consistency that slowly fades leaving stiff standing peaks and deep craters. The had leaves thick chunky lacing. The nose is spicy and almost lightly meaty with moderate earthy barnyard twang. Minor cellar notes and a slight dustiness lead to a vague lagery aroma of clean malts. The beer seems incredibly spicy on the front end and almost hints of a smoked or cured meat, with a lean toward prosciutto. Massive malt notes enter in on the mid-palate and line up a profile that is at once sweet and powdery dry. A dash of ginger accents a moderate grassiness on the bank end. The carbonation is pointed from the mid-palate through until the end. The finish is dry, lightly earthy and organic, with a persistent freshness.